Sakthi School of Nursing is the first Nursing School in Karur District. It was established by Sri Kamakshi Seva Sangh trust in the year of 2006. 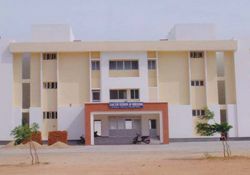 Sakthi School of Nursing and Hostel Built up area is 60,000 square feet and having a total land of 42 acres situated at in between New National high way Trichy to Coimbatore NH 65 and Karur to Dindigul via Esanatham main road, Aachimangalam, Thanthonimalai (post) Karur 639005.